Every October artists from around the world pull out their pens and inkpots to draw a daily picture and share them on social media, tagging #inktober or #inktober2017. The staff at the library in Pawleys Island love both art and games, so this year we are taking full advantage of Inktober to expose our patrons to the joy of art games. The problem with art games is that for years there wasn’t much depth of catalog for that type of game. Pictionary, since release in 1985, was the omnipresence art game. It reigned supreme both because of it’s familiar charade like game play and its ubiquity on the shelves of mass market game and bookstore shelves alike. Much like Trivial Pursuit, Pictionary was everywhere; when you said drawing game in the ‘90s people thought Pictionary. Now that we are in the back half of the 2010s there is a great variety in both form and function. 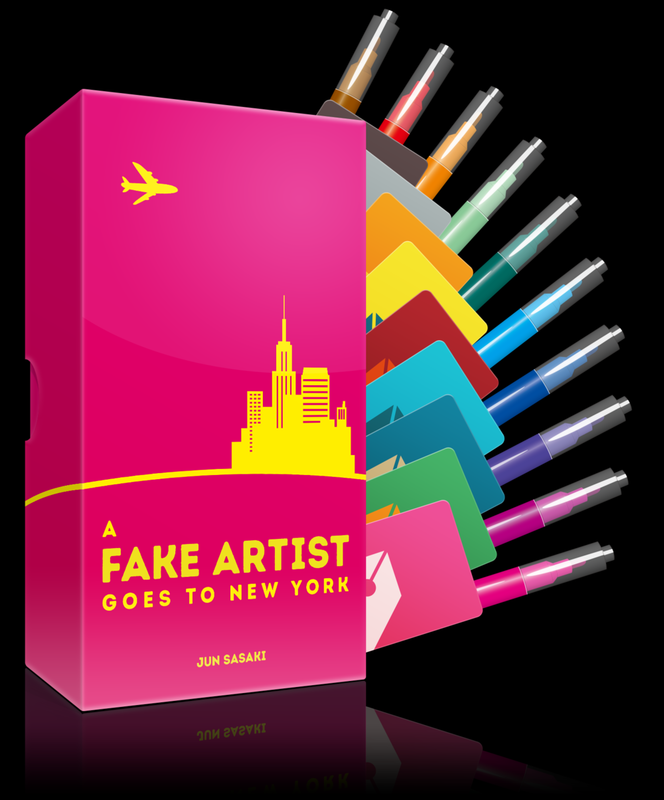 A Fake Artist is both a social deduction game and the most colorful one-vs-many art game on the market. One “fake artist” is trying to blend in and convince all of the “real artists” that they are not the fake. The patron player decides on a category that everyone knows, and then hands out notes to all the players with something from that category - a category might be sports, but the thing from the category could be any known sport, or even something more specific like a star athlete, stadium, or something like a football helmet. Then everyone but the patron takes turns drawing one line on the canvas tile, each player using a different color, until everyone has made two lines. Then players examine the created piece of art and then vote, trying to suss out the fake artist. If the artists don't guess who the fake is then the patron and the fake artist win the round. A Fake Artist is a party game that plays quickly without actually requiring any real artistic skill. It is easy, fast and fun. Telestrations, also known as Eat Poop You Cat, is essentially the Telephone Game where players alternate drawing a picture of the word that was passed to them or guessing the word that the picture represents. Each player starts with a notebook, a dry erase pen, and a randomly selected word; after drawing the word they pass the notebook on and this repeats until the notebooks return to their starting players. Players then reveal their original words and show how things changed from the initial page to the last one. Telestrations is lots of fun, and has been popular at our library with patrons and library staff alike. In theory there is a scoring system but you should ignore it, the game is much more enjoyable without it. USAOpoly has created an adult version which is probably not appropriate for most schools or libraries due to mature or vulgar content, but you may find it an interesting addition to your home collection. 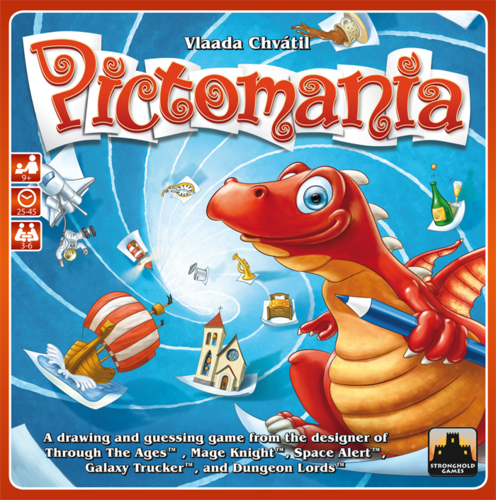 Pictomania is one of the most direct inheritors of the Pictionary style of art game. Over five rounds players are dividing their attention between drawing their own pictures and guessing what the other players are drawing; players claim more points for being skilled and speedy artists or insightful guessers with the worst guesser each round being penalized. Yup, that’s right, players race each other in a real-time-simultaneous-drawing-and-guessing-activity to get points for early correct guesses and get a bonus for being done early. After five rounds the game is over. The only problem with Pictomania is how the cards with the answers that players have to guess from may be tough to see with a full table. If the cards were double sided, duplicating the information on the back, then the clever use of card stands would do much more to facilitate the game. Other than that Pictomania is a drawing game that is as much about drawing as it is guessing and really feels like it’s a game for people who are enthusiastic about both art and games. At the beginning of Mangaka each player draws three theme cards which provides the themes they will need to include in all four rounds of play. Players then draw two panels of a cartoon utilizing their themes. As the rounds progress, the challenge becomes more difficult by the inclusion of more panels they must fill and and trend cards. In the first round players must fill two panels in five minutes, with two more added for each of the subsequent rounds but the time they have to draw does not increase! When you add the trend cards to the mix later rounds can be chaotic and out of control, just like real manga. After each round players show off their creations and get points for how well they’ve included their themes and met the trends. The scoring, like in many art games, is the least interesting part of the game. However Mangaka is a great game for artists and manga fans of all stripes. The cards play off of many familiar anime tropes and provide a great inspiration for other art activities including as inspiration for Inktober art ideas. Here is a link to an album of pics from some of our previous runs of Mangaka. That’s our top four art games, let us know what your favorite art games are in the comments! Posted on October 25, 2017 by Donald Dennis and filed under Tabletop and tagged inktober tabletop art games.